With the constant development of new eCommerce solutions you may find yourself striving to keep your business on the same level. Hence, having an online store is not a privilege, but a necessity. Still, let’s say you already have an estore. How do you keep your sales on the appropriate level, your customers happy and all store operations properly streamlined? Having a proper eCommerce solution is the key concept. Except, it often happens that the business outgrows the platform the store stands on. There are tons of reasons for this, including the mismatch of the used technology, the low-key developer community, the inappropriate CMS, etc. For that matter, you might want to consider import to another shopping cart. You need a solution that supports all the latest technologies, has a strong developer community and is flexible enough to handle all your business operations to the greatest extent. In this case, choosing Magento eCommerce platform is the way out here. This article is not about the benefits of Magento, neither it is about its downsides. Here are the instructions for the step-by-step procedure of the import process from a/any shopping cart platform to Magento. It’s all about making it all work. Shopping cart import is the process of moving the data and files of a web store from the source shopping cart to the target shopping cart. Source shopping cart is the platform the store data is imported from, i.e. your current shopping cart. Target shopping cart is the platform the store data is imported to, i.e. Magento or Magento Go. There are several differences between import to Magento and Magento Go. Let’s take a look at the step-by-step procedure of the import process below. Schedule the import when your website has the lowest number of visitors. Check out when your website traffic is low. For a web-store it usually falls on the weekend, since the highest sales rates are, as a rule, recorded at the midweek. Inform everyone having particular interest in your store website about the planned import. This should be done internally, i.e. employees, stockholders, as well as externally as well, i.e. supplies, customers and website visitors. You can simply send the link redirecting to the date and time of the import as well as the anticipated completion date to all the interested parties. Set a deadline for all content updates on your store website. Postpone any major additions to the website, i. e. new sections and features, product and catalog modifications, until after the import. Finish up all the updates at least 3 business days before the import. After the content update deadline date, make sure you back-up all the data, including databases, images, scripts, multimedia and other files. This could be done on a DVD, Zip Drive or an external hard drive, whatever is more appropriate. Keep in mind that most of the hosting services have configurable functions for file and database back-up. NOTE: It’s important to implement data back-up before every major operation, e.g. change of CMS, Shop Import or Remigration, Pre-Launch, etc. 1. Access to the Domain Management Control Panel. The domain name registrar should provide you with the login form URL, username and password. You need to change the data on NS servers of your domain. Most hosting providers will have 2 to 3 domain name server addresses reserved for the new location of your store website. The info will be used in the process of domain name transfer to the server of the new hosting provider after the transfer of all the website files. 2. Access to the Hosting Control Panel. You need to know the login form URL, username and password. Domain and hosting plan can be bought together from one provider, as well as separately. In this case you need to be able to control the hosting settings yourself, i.e. creating new databases, changing the passwords, etc. If you change the hosting provider, make sure you have all the data for accessing the Hosting Control Panel for the source shopping cart and for the target shopping cart. 3. Access to the FTP (File Transfer Protocol Information). You need to know the hostname (this can be the IP address), account username and password. If you change the hosting provider, you need to have access to the FTP for your source shopping cart as well as for the target shopping cart separately. 4. Access to the MySQL database for your new Magento store. You need to know the hostname, username, password and the database name. This data will be required during the installation of Magento. 5. Magento Go API Key and API Password. This is required for import to Magento Go only. Download the latest Magento installation and follow the instructions to install and configure it. Test the new website by typing in either the dedicated IP address or the shared hosting address. Import your store data using Cart2Cart online import service. Before that, make sure your source cart is in the supported cart list. Register a new File2Cart account. If you have already been registered, log in to that account. To estimate import costs use the Import Estimator. Set up new import and follow the wizard instructions. Run the DEMO import to see sample results. You can use DEMO import to import the limited number of products/categories. Process the payment and run FULL import. File2cart provides Assisted Import Service to help out in the process of import. Check the final results after import is 100% complete. Contact File2Cart Support Center for additional assistance and advice. If your store was customized or you used non-standard store configuration, you can request the customization service for extra cost. If your source shopping cart is not hosted, make sure you install the bridge files. When import to downloadable Magento, install the bridge file for your target shopping cart as well. When import you Magento Go, specify the API Key and API Password during the Import Wizard. Sign in to Magento Go admin area. Go to System > Web Services > Roles. Press button Add New Role enter role name ('cart2cart' for example) . Go to tab Role Resources and check All in field Resource Access. Go to System > Web Services > Users. Press button Add New User and fill the form. Go to tab User Role and choose role that created before in steps 3. To make sure you preserve all the forms available from your website, go to you account control panel and follow the instructions for customizing the form to work with the new server. Most hosting providers have "plug and play" web forms that are easy to implement. If you have doubts about the implementation of the form, contact the Support Center of your hosting provider to get all the info you need. Implement 301 redirects for all old URLs. Define all the URLs on the old website and outline the pages on the new website where the URLs will be redirected to. This way, the external links will be referred to the active pages. If you import the new website data in one night and use the 301 redirects, search engines will easily crawl your website. You won’t need to worry about anything. Add custom 404 page. It should include the links to the main pages on the new website. This way search engine crawlers and your website visitors will lend on a 404 page. Right after the import generate and submit your sitemap to the webmaster tools, as well as generate the XML sitemap. Immediately after that submit the sitemap to searhc engines and track the activities for possible crawl errors in the first few months. At this point leave the website and get back to it after a while. There are usually some issues coming out, so you can correct them right away. Apart from your website, check if the store functionality is alright. you can create a new test product on the store and buy it yourself following the standard procedure for purchase. This way you will test how it all actually works. If you are changing the hosting provider, you need to update the NS. Go to your domain name registrar and change the DNS to the new webhost. The change will take 2 to 3 days be visible online. For this matter, make sure you implement these actions while there is low traffic on the website. Now the transferring process is complete! Find out how to manage your Magento store after the import. After 1-2 days after the import is complete, type in the domain name and check out if the website works fine on the new server. Follow the procedure again to ensure that all the links and forms are active. For the next 2-3 weeks after cancelling the account with the old web hosting, continue testing the website. This way you will be sure that all the data and files were successfully imported. If you identify any issues reported by your customers, make sure to check the reason - either it occurs as the result of website import or the actual store data import. Archive the website on the old web hosting. You might need to refer to it in the future. Although the import process is pretty solid, you won’t encounter any difficulties if you follow the step-by-step procedures outlined above. 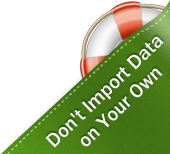 Remember that import an online store is not only about the actual store data, i.e. products, customers, orders, etc., but also about your website data and content. Take it one step at a time and your customers won’t even notice that your store moved, but you will enjoy the benefits of your new Magento based store.